Did you know that it takes an elephant 22 months of waiting before it's calf is born? Bringing a book into the world takes just about that long. When the advance copy finally arrives on your doorstep in the well worn hands of the delivery man you rip the package open with a mix of fear and excitement. That happened to me today. Speaking of reproduction, for me fear usually revolves around the accurate reproduction of my color. Was the brave printer able to reproduce the hues and subtle textures that I scraped, dabbed and coaxed into life? With each and every book I have learned to expect calls from the adventurous art director attempting to match the azuline blue of a Mexican tile or eggplant purple of a passing cloud. Proof after proof is sent back and forth from artist to printer until the heat of the flames under the pot is just the right radiant shade of amarillo-oro. For me color is an expression of my identity, my heritage and I believe it is the most direct route to the emotions of children and families who will turn the pages of my books. As a new book enters into this world you feel like celebrating when recognizing a familiar hue that resonates for you. You breathe a sigh when you see the pages where the farm maiden cries "Ay!" and the pot full of arroz con leche simmers, sputters, and bubbles with color on the stove. 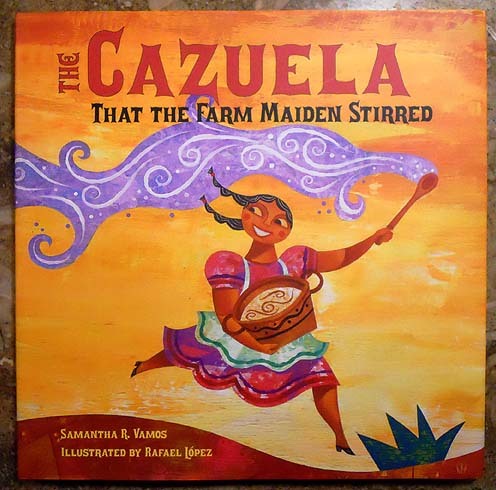 I'm so excited to share with readers this new book The Cazuela that the Farm Maiden Stirred from the playful hand of clever writer Samantha Vamos. 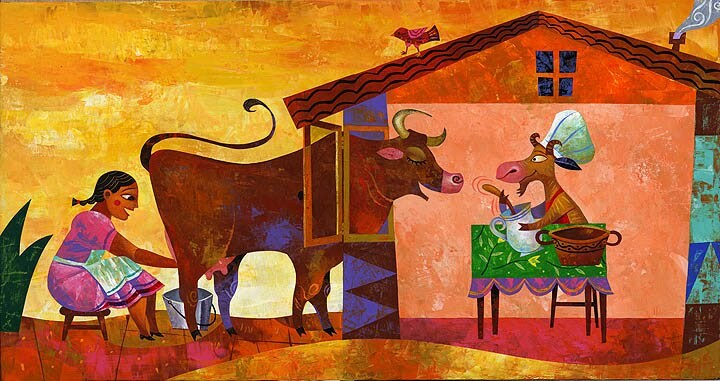 When a farm girl starts cooking, a bunch of magical animals want to get into the kitchen and help [reminds me of my childhood when my mother made Christmas tamales]. 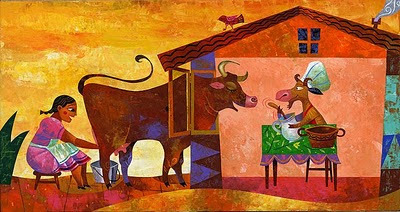 The cow brings milk, the hen her eggs and the duck with a straw hat heads to the mercado for just the right ingredients. There's a resourceful donkey in cowboy boots who plucks a lime off the tree to add to the simmering pot. Eventually they break out the spoons, a drum, banjo and maraca and start to sing and dance. At the end of the book you will find the recipe for delicious Arroz Con Leche Latin American Rice Pudding. This book is a spicy tribute to the classic nursery rhyme "The House that Jack Built" and is a bilingual celebration of community and food. 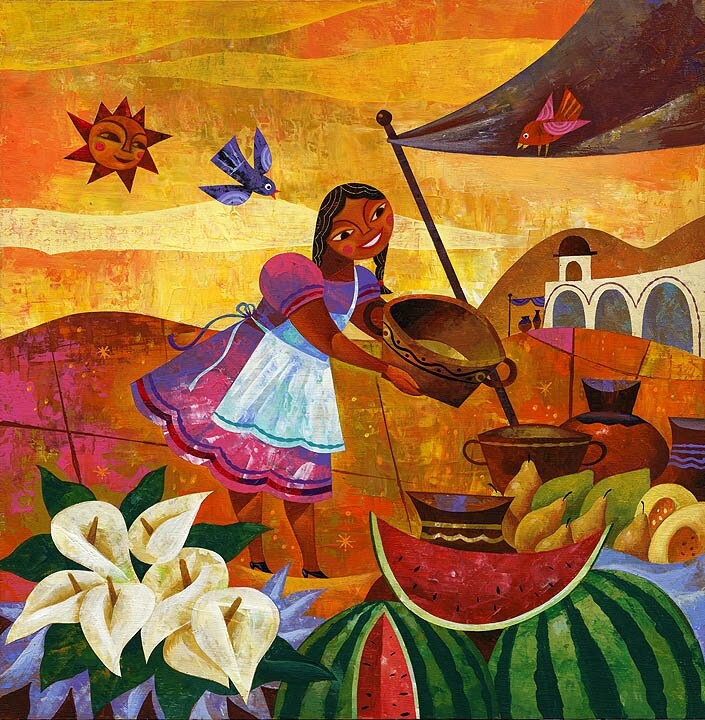 I want to thank my Charlesbridge family for faithfully reproducing my colors and I'm grateful for the patience of art director Susan Sherman for her help stirring up the colors of La Cazuela. 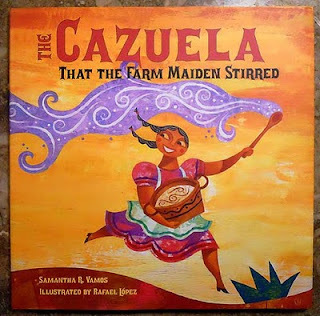 From Samantha Vamos: The idea for The Cazuela That The Farm Maiden Stirred occurred to me one wintry, weekend morning. I was in the kitchen gathering ingredients to make pancakes and discovered that I lacked both milk and eggs. At the time, my husband and I lived in Chicago, Illinois and did not own a car. That morning was bitter cold with gusty winds and the prospect of walking to the subway or waiting for a bus to the nearest grocery store was not appealing. When I realized that my alternative was eating a bowl of cereal without milk, I considered calling a neighbor. Suddenly, I thought how amusing it would be if I lived on a farm and I could simply call one of my animal “neighbors” for a pail of milk or a basket of eggs. Envisioning myself a farm maiden, I smiled and my story took off from there. The proverb “necessity is the mother of invention” seems apt when I think about the creation of this story. I craved pancakes and I imagined ways to obtain the ingredients I needed. When I reflect on my overall mindset, however, there were two additional circumstances that resulted in my brain producing the idea behind The Cazuela That The Farm Maiden Stirred. First, I had always wanted to write a story that featured a recipe. Making things in the kitchen is fun. Second, I describe that time period as having had “bilingual on the brain.” I had recently transformed a formerly all-English manuscript of mine to make it bilingual, resulting in Before You Were Here, Mi Amor (published by Viking Children’s Books in 2009). As I incorporated Spanish words, the text flowed differently – the words sounded more intimate and tender. The English text with Spanish words woven in resonated because the bilingual manner of speaking reminded me of the way I had heard languages (in addition to English, my father fluently speaks four languages) expressed as a child. 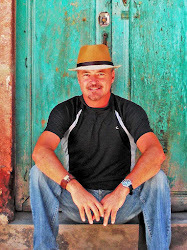 After writing Before You Were Here, Mi Amor, I had hoped that I’d become inspired with another idea that would allow me to write a second, bilingual story. So, on that morning, as I held a stirring spoon and imagined myself the farm maiden, I tried out this first line: “This is the pot that the farm maiden stirred.” I liked the rhythm. I was immediately reminded of the British nursery rhyme, “This Is The House That Jack Built” and decided I would try following that rhyme’s format – a cumulative tale where the action or lines repeat as the story progresses. First, I wanted the story to be bilingual. Second, the cumulative format: I wanted to structure the story so that as the action built, specific Spanish words repeated. That way the Spanish words would be reinforced and easy to remember. 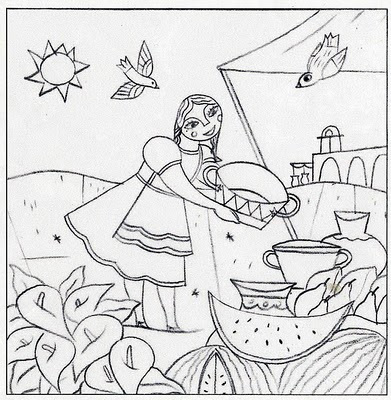 Third, I wanted to incorporate a recipe that would be revealed at the story’s end. I hoped that readers would try to guess what the characters were making in the pot that the farm maiden stirred. Utilizing a recipe in this manner meant weaving the storyline around specific ingredients. Fourth, I needed to create characters that could provide the necessary ingredients to the pot. 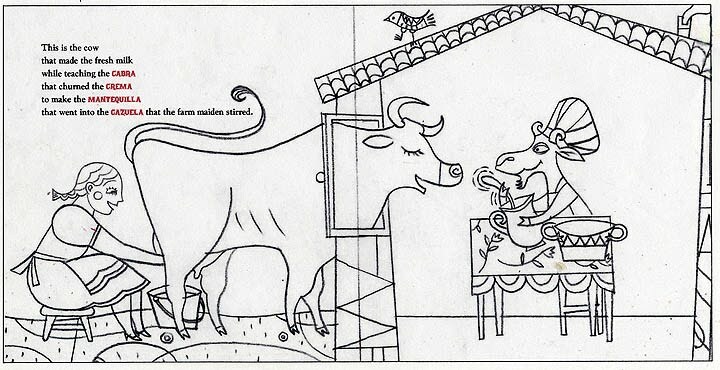 The cow and hen were obvious choices as they could respectively provide milk and eggs. 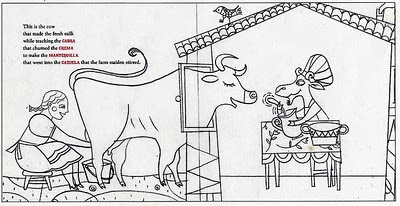 When I thought about a pot, milk, and eggs, I realized that the farm maiden could make rice pudding. Now all I needed were a few more characters to deliver the remaining ingredients: sugar, rice, butter, cream, and a lime. After including a goat, duck, donkey, and a farmer, I had the framework of the book, or as I see it now, the “equation” for my story: five animal characters, their farmer, and farm maiden plus ingredients create Arroz Con Leche in a bilingual, cumulative tale! Inspired, I headed downstairs to my computer. I never finished making pancakes that morning, but I did manage to write a first draft of our story! Rafael's art is always an inspiration-- I find myself just staring at it, finding new bits to marvel over every time! Bravo!! I love hearing the story behind the story. One day someone will put a book with such stories together. When they do this should be in it, beautiful spreads and all. Thank you so much for sharing.